The installation of high-quality cycle infrastructure can boost house prices by fifty percent, claims new research. The addition in 2013 of protection to the cycle lanes on Royal College Street in London resulted in a 45 percent increase in value for 90 nearby properties, adding £7.7m value in sales in comparison to other properties in Camden, which increased by 23 percent. Following the construction of the Torrington protected cycleway, properties within 100 metres of the route increased in value by 50 percent, whilst the average increase across Camden was 10 percent. The research was carried out by Systra, a company involved in the planning of cycle infrastructure in London, including the "mini-Holland" scheme in Kingston upon Thames. Systra is owned by French train operators RATP and SNCF. 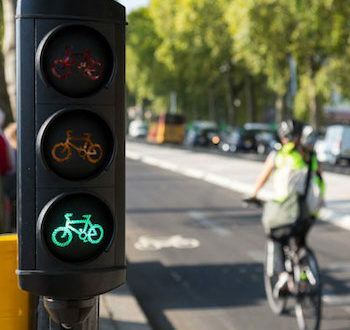 Systra’s Giulio Ferrini conducted the research, which was first presented at the recent Hackney Cycle Conference. He said: "Cycle infrastructure is still treated with scepticism by developers, who try to avoid building it, as they do not see any added value. But data does appear to indicate that the construction of segregated cycle infrastructure leads to an increase in property value." He added: "This relationship could be used by public bodies to construct a business case for cycling to obtain support from non-cycling residents. The private sector could find itself lobbying for or funding segregated cycle lanes to increase land value in poorly connected areas or justify building to a higher density in low Public Transport Accessibility Level areas, as residents will be cycling rather than taking public transport." Systra’s corporate gameplan is to "reduce our reliance upon the private car for every journey." It states that "not only are cars a major contributor to air pollution, the social costs can include road crashes and reduced health through lack of physical activity, and time wasted in traffic congestion has an enormous knock-on economic cost." The French company, founded in 1957, "delivers practical projects that reduce unnecessary car use for local authorities throughout the UK." The new head of cycling at Systra is Paul Osborne, a 20-year cycle advocacy veteran who formerly worked for Sustrans. He pioneered the national Safe Routes to Schools initiative and led Sustrans’ education travel initiatives and directed a range of infrastructure and behaviour change projects.